BMW has unveiled its new 3 Series at the Paris Motor Show. The seventh-generation of the company’s super-popular saloon is probably the most important reveal of the Show. It’s got new technology, new advanced safety kit, and you’ll be able to buy a plug-in hybrid version for the first time. As expected, the design is evolutionary rather than revolutionary. It’s got a new kidney grille, new headlights, new bumper, and sharper lines at the front, and new lights at the back. It is a little longer, wider, and ever so slightly taller, by a whole 1mm. The wheelbase has also been extended. You’ll get 17-inch alloy wheels as standard, 18-inch wheels on the Sport and M Sport models, and 19-inch light-alloys sit on the options list. There’s a few more changes to the interior than the exterior. BMW says the cabin is now more driver-focused and simplified. The infotainment system is accessed via a 10.3-inch touch-screen, and there’s also a 12.3-inch digital cockpit available – for the first time in a 3 Series. Like in other BMWs, you can also control the infotainment system via the iDrive wheel on the centre console, or by speaking to it, or waving your arms around (gesture control). BMW says there’s more space inside the new 3 Series, including 11mm more legroom for rear passengers, and more headroom, too. The boot size is 480 litres, which is the same as the last generation. However, that included storage under the boot floor, so the new 3 Series’ boot does look bigger, by around 35 litres. Standard equipment on the entry-level SE model includes ambient lighting, a reversing camera, electric folding rear view mirrors, three-zone air-conditioning and LED headlights. At launch, the 3 Series will be offered with a petrol engine and two diesels. The petrol is the 330i, a 2.0-litre four-cylinder turbocharged engine with 260 horsepower. It’s paired with an eight-speed automatic gearbox, with a claimed fuel economy of 48.7mpg. If you’re after a diesel engine, the 320d is a 2.0-litre four-cylinder unit with 190 horsepower. It comes with a six-speed manual gearbox as standard, and has a claimed fuel economy of 67.3mpg. 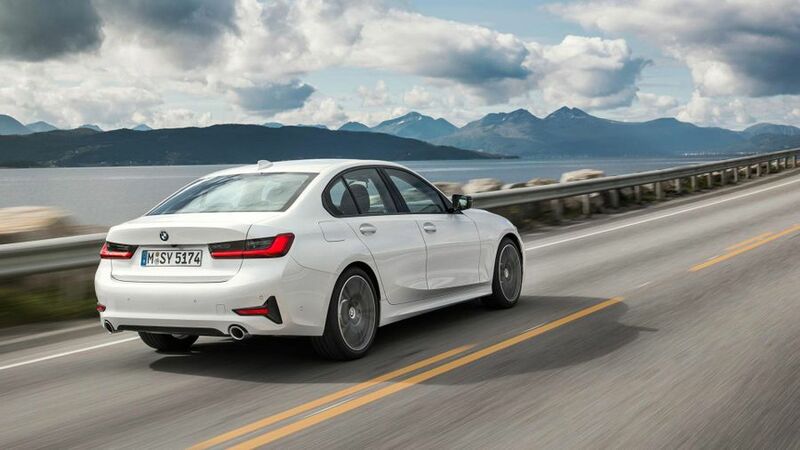 There’s also a four-wheel drive 320d xDrive, which gets an eight-speed automatic gearbox as standard. The engine range will expand to include a bigger 3.0-litre diesel engine, and a 330e plug-in hybrid will be added to the range. It will be a 2.0-litre four-cylinder petrol engine with a 90-horsepower electric motor. It’s expected to have an all-electric range of 37 miles, and CO2 emissions below 40g/km. Performance models will also be on the way further down the line. You get a decent amount of standard safety kit on the new 3 Series, and some fancy driving assistance systems as standard, including collision and pedestrian warning with automatic braking. Adaptive cruise control with stop & go function, side collision alert, and steering and lane control assist are available on the options list. In the UK, the new BMW 3 Series will be offered in entry-level SE, Sport, and M Sport trims. 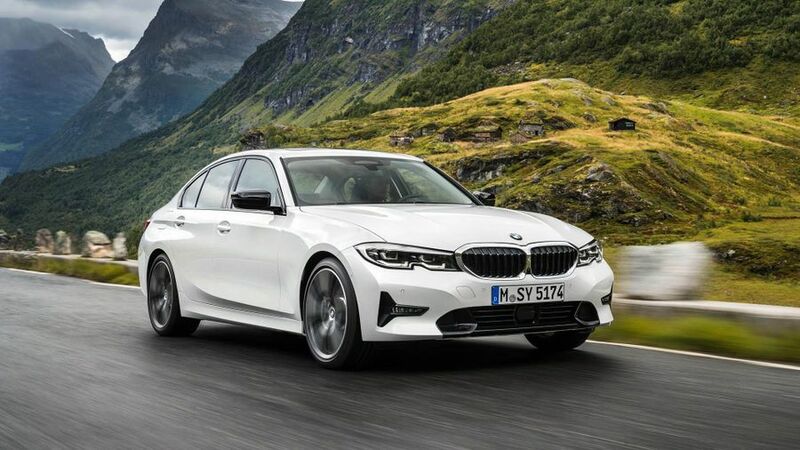 You’ll be able to order the new 3 Series from 9 March 2019, with prices starting at £33,610. The Touring estate version will arrive in autumn 2019. We've got more information on all the cars from the 2018 Paris Motor Show. Interested in buying a BMW 3 Series?